Samsung Electronics Co. Ltd introduces the Galaxy Note8 as the next level in the Note series. 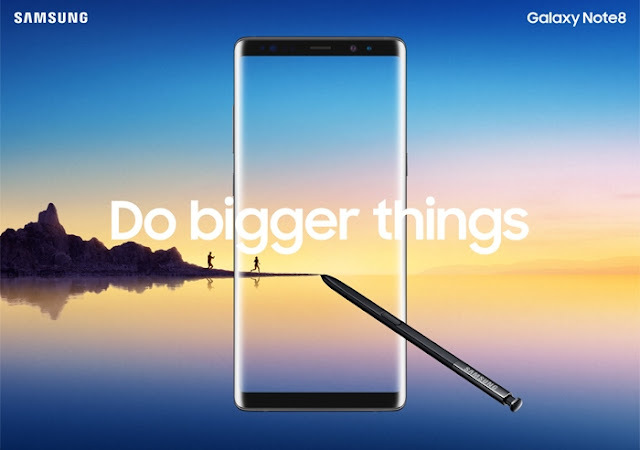 Billed as a device for people on the move and who want to “do Bigger things”, the Galaxy Note8 has a bigger Infinity Display that fits comfortably in one hand, an S Pen to communicate in more personal ways and Samsung’s best-ever smartphone camera – which is built to capture life’s precious moments. According to Samsung’s internal market insights, 85 percent of these Note users say they’re proud to show off their Note and recommend it to friends, while 75 percent say it’s the best phone they’ve ever had. Here’s what you can do with the great Galaxy Note8. The Galaxy Note8 has the biggest screen ever seen on a Note device, yet its narrow body makes it comfortable to hold. The 6.3-inch Quad HD+ Super AMOLED Infinity Display lets you see more and scroll less. The Galaxy Note8 gives the user more room to watch, read and draw, thereby making it the ultimate multitasking smartphone. Note users have long been able to do more with Multi Window. With the Galaxy Note8, the new App Pair feature further lets you create a custom pair of apps on the Edge panel and simultaneously launch two apps with ease. This enables you to do things such as watching a video while messaging your friends or dialing into a conference call with the number and agenda in front of you. 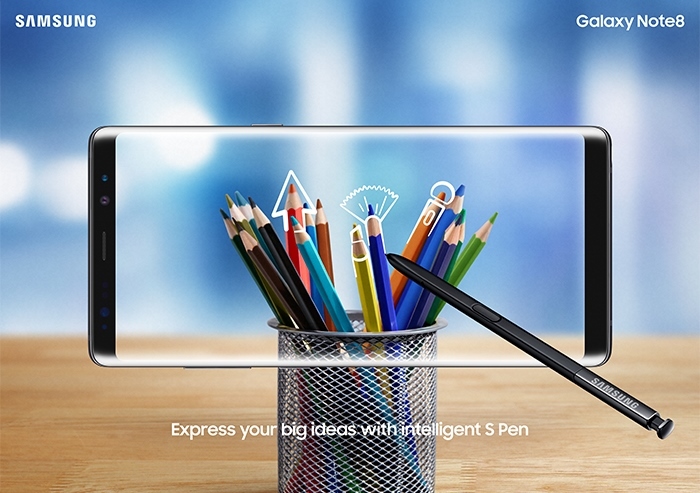 Since its introduction, the S Pen has been one of the Note’s defining features. With the Galaxy Note8, the enhanced S Pen unlocks entirely new ways to write, draw, and interact with the phone as well as communicate with friends, family and associates. It has a finer tip, improved pressure sensitivity3 and features that enable users to express themselves in ways that no other stylus or smartphone ever has. When communicating through text isn’t enough, Live Message allows you to reveal your unique personality and tell expressive stories. 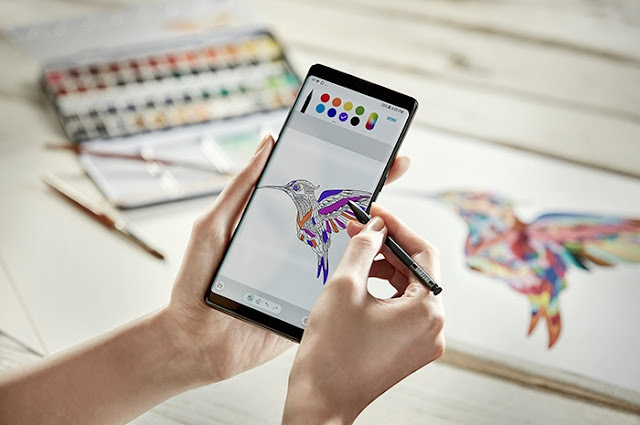 With the Galaxy Note8, you can now share animated texts or drawings across platforms that support animated GIFs (AGIF). It’s a whole new way of communicating with the S Pen – adding lively and emotional connections that bring your messages to life. The Always On Display on the Galaxy Note8 is even more powerful as it allows users to stay on top of their notifications without unlocking the device. The Screen off Memo function is activated as soon as you remove the S Pen and allows you to take up to 100 pages of notes, pin notes to the Always On Display and make edits directly from the Always On Display. For most consumers, one of the things they look forward to when purchasing a new device is the camera. Samsung smartphone cameras are known as the industry benchmark and the Galaxy Note8 delivers the most powerful smartphone camera yet. Equipped with two 12MP rear cameras with Optical Image Stabilisation (OIS) on both the wide-angle lens and the telephoto lens, the Galaxy Note8 enables you to capture sharper images – whether you’re exploring a new city or running around your backyard. For more advanced photography, the Galaxy Note8’s Live Focus feature lets you control the depth of field by allowing you to adjust the bokeh effect in preview mode as well as after you take the photo. In Dual Capture mode, the two rear cameras take pictures simultaneously and allow you to save both images; one close-up shot from the telephoto lens and one wide-angle shot that shows the entire background. The Note8 is enabled to utilise the command application, Bixby, which launched in South Africa yesterday and is already assisting S8 and S8+ device users to get things done faster and easier. It is an intelligent interface which will support almost every task that your device application can perform through use of voice, touch or text. The interface also understands the way you ‘actually’ speak, ask questions and make requests and uses this insight when actioning cross-application commands. Let’s say that you take a photo and then tell Bixby to “send the picture just taken to mom,” Bixby will know which photo you are referring to and will text it to your mom. Thus, making interactions with your smartphone easier and more intuitive. Most impressively, Bixby’s deep integration is built into the device settings to enable users to change phone options, such as setting the screen timeout or showing all notifications without interrupting what you are currently doing. Water and Dust Resistance: Four years ago, Samsung introduced the first Galaxy device with water resistance. And today, you can take your Note almost anywhere you want with water and dust resistance (IP684) on the device and the S Pen. You can write, even when the display is wet. Fast Wireless Charging: Two years ago, we introduced the first Galaxy device with wireless charging. The Galaxy Note8 supports the most advanced wireless charging capabilities yet, so you can get a quick, convenient charge5 without concerns about ports or wires. Security: The Galaxy Note8 offers a choice of biometric authentication options, including iris and fingerprint scanning, while Samsung Knox6 provides defense-grade security at the hardware and software layers with Secure Folder, which keeps your personal and professional data separate. Powerful Performance: With 6GB RAM, a 10nm processor, and expandable memory (up to 256GB), you have the power you need to browse, stream, play games and multitask. Innovative Mobile Experiences: Samsung DeX enables a desktop experience, powered by your phone. You can keep your files on your device, conduct work on the go, and use Samsung DeX when you need an even bigger screen. Samsung continues to uphold its commitment to lead the industry in battery safety. The Galaxy Note8’s battery has undergone Samsung’s 8-Point Battery Safety Check, which is the most stringent in the industry. "We have been closely working with Samsung to make meaningful advancements in the science of smartphone quality and safety evaluation. As a result, the Galaxy Note8 has successfully completed a rigorous series of device and battery safety compatibility test protocols. We look forward to maintaining our strategic relationship with Samsung and helping ensure device safety for all consumers,” said Sajeev Jesudas, President, UL International. The Galaxy Note8 will be available starting in mid-September and will be offered in Midnight Black, Orchid Grey and Maple Gold.